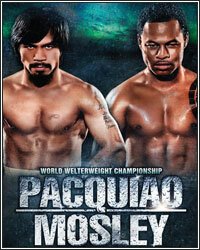 PACQUIAO VS. MOSLEY GENERATES 1.3 MILLION PPV BUYS? Sources close to the information have informed us that Manny Pacquiao's unanimous decision victory over Shane Mosley last month generated roughly 1.3 million pay-per-view buys. Initially, early projections had promoter Bob Arum estimating at least 1.2 million buys, but with the bout being distributed by Showtime Pay-Per-View and promoted heavily by CBS on network television, expectations were high for a number between 1.4 and 1.5 million. Just days after the fight, a report in the New York Times said Arum expected to know the exact numbers within a week, but that was nearly a month ago. Although representatives from Top Rank Promotions have yet to make the final number official, FightHype.com was told over the weekend by two sources that the number is right around 1.3 million. "Bob told us to expect between 1.3 and 1.4 million, but it looks like it's going to be closer to 1.3," said one source close to Shane Mosley's camp. Another source with knowledge of the numbers flat out stated, "It was 1.3 million!" Obviously, a number like 1.3 million has to be considered a success when it comes to pay-per-view events, however, given that Top Rank has been slow to make the official numbers known to the public, one has to wonder if Bob Arum is truly pleased with the final tally. Although it exceeded the number of pay-per-view buys for any of Pacquiao's previous bouts, it still fell short of the 1.4 million pay-per-view buys generated when Floyd Mayweatehr fought Shane Mosley in May of 2010. It should be noted that unlike most boxing pay-per-view events in the past, Pacquiao vs. Mosley, which aired live on Saturday, May 7, was also still available for purchase the following day after the event first aired.